Today’s Feature Friday spotlights one of our retail partners in New Jersey: C.S. Cagas. Located in Montclair, C.S. Cagas opened in October 2015. Chris, the store’s namesake, was motivated to opened the shop by his passion for fashion and desire to help men look their best. C.S. Cagas carries ready-to-wear clothing and accessories and specializes in custom clothing. The Township of Montclair was founded in 1868. Montclair gets its name for its location along the Watchung Mountains. “Montclair” is French for “clear mountain.” The township’s highest elevation offers a view of the New York City skyline, which is approximately thirty minutes away. Today’s Feature Friday spotlights one of our retail partners in South Carolina: Eagle Bay Outfitters. Located in Mullins, the Eagle Bay Outfitters story dates back more than 40 years. Keith Herring opened Shoe Fair (a shoe store) in 1972. In 2015, he expanded the Shoe Fair brand to include Eagle Bay Outfitters. Eagle Bay Outfitters carries a wide selection of casual and sportswear and lifestyle accessories. Mullins is a small city located approximately an hour inland of the Atlantic. Mullins is best known for its contribution to the tobacco industry. Known as the “Tobacco Capital” of the state, Mullins is home of the South Carolina Tobacco Museum. Spring is almost here! We’re excited to introduce our Spring 2016 Sock Collection. This year’s Spring Collection features two bold new colors (Mint Green and Coral), two new stripe styles (Mini and Narrow Stripes), a new patterned design (Golf Club), and many new colorways of our returning styles (Double Stripes, Skull and Crossbones). Shop the new collection here! Today’s Feature Friday spotlights one of our retail partners in California: Pelican Rock. Matthew Gerhardt opened Pelican Rock in Walnut Creek in 2012. He re-located the store to Danville in 2014. Gerhardt named the shop after a family vacation spot on St. Martin Island. Pelican Rock carries current and classic menswear for gentlemen of all ages. Danville is a wealthy community near Oakland and San Francisco. The town’s proximity to the East Bay makes it an appealing place to live. The popular Iron Horse Regional Trail – a rail trail for pedestrians, cyclists, and horse riders – runs through Danville. Most men have a pair of go-to khakis. Well, we’re excited to introduce you to your new pair of go-to khakis. Our khaki trousers are hand-tailored in Brooklyn, New York at a factory with nearly 100 years of tailoring expertise. 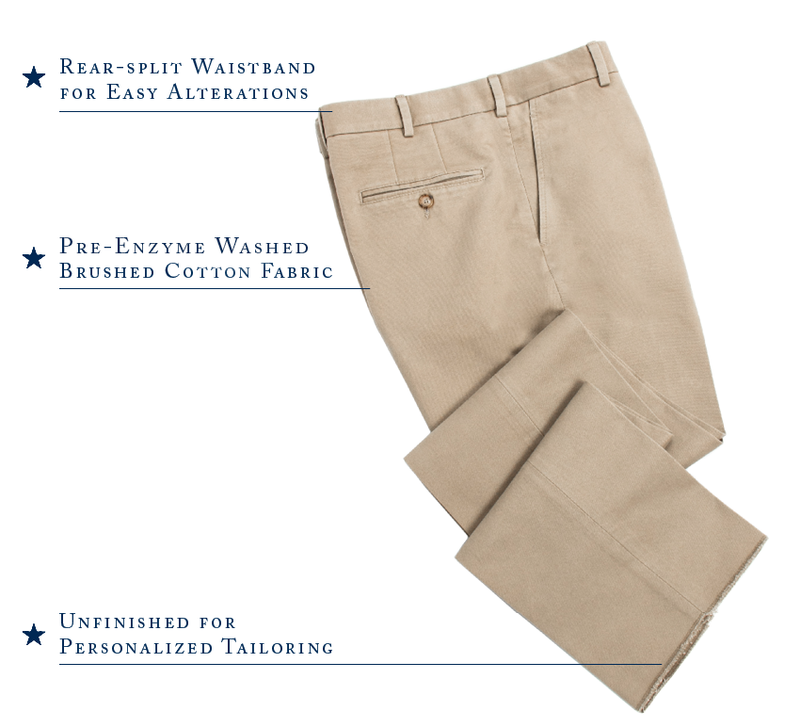 The pre-enzyme washed brushed cotton fabric makes for an extra soft pant – just what you want in a pair of everyday khakis. 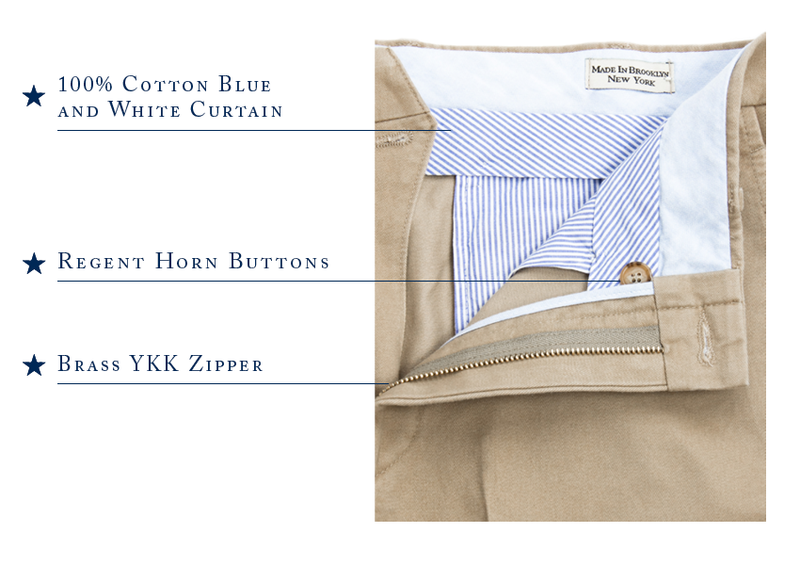 At Dapper Classics, our motto is “Dapper is in the Details.” The details are what set our khakis apart from the rest. Discerning men will appreciate the small things that make these pants extra special – like the durable, brass YKK zipper and the timeless Regent Horn buttons. Our All-American Khakis are available in classic and trim fits. These versatile and comfortable pants are sure to become your go-to khakis. Limited quantities available. Get yours while supplies last! Today’s Feature Friday spotlights one of our retail partners in Virginia: Davidsons. Joe Davidson opened Davidsons in Roanoke in 1910 after entering the United States through Ellis Island. The store is now in its third-generation of family ownership and has been servicing the Roanoke Valley for more than 100 years. The shop carries casual, dress, and tailored clothing and offers an in-house grooming service, Jacks. Originally known as “Big Lick”, Roanoke is the largest city in the Blue Ridge Mountain region. Roanoke is nicknamed “Star City” after the Mill Mountain Star. The star – the largest of its kind in the world – was originally constructed in 1949 as a Christmas decoration; however, it has been left up ever since due to its popularity.